If you have fresh turmeric on hand it's brilliant in these muffins, giving them a golden glow and complex flavour. These are especially good warm and fresh after baking, but they reheat well either in the microwave or oven. 1. Heat the oven to 190C (170C fan-forced), and line the cups of a muffin tray with paper cases. 2. In a large mixing bowl combine the flour, cornmeal, baking powder and bicarbonate of soda. Mix though the cheddar evenly. 3. Put the butter in a saucepan with the sweet potato, chilli and turmeric, and cook over a high heat until the butter is sizzling. Remove from the heat, leave to cool then beat in the yoghurt, eggs and sugar. 4. Fold the yoghurt mixture through the dry ingredients until it's evenly combined and thick. Spoon evenly into the paper cases. 5. 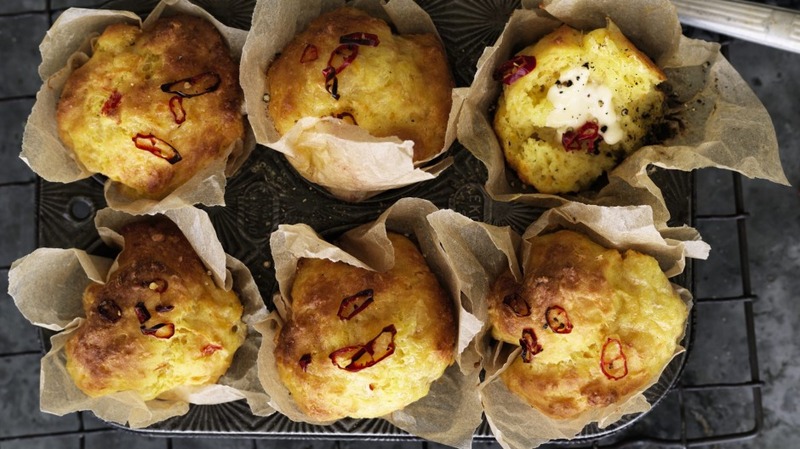 Top each muffin with two to three slices of chilli, place in the oven and bake for about 25 minutes until risen and golden. Remove muffins from the tin and place on a wire rack to cool. If you like this recipe, try my triple ginger banana muffins.